It's all about security ! NecSys Tech - your ideas are safe with us! We are web solutions based company that allows you to take your bussiness or personal ideas to the next level! We offer high quality web services such as CRM (Customer-relationship management), Web Hosting, Cloud Hosting, Web Design, Internet Marketing and most important, IT Security! For more details, do not hesitate to contact us! 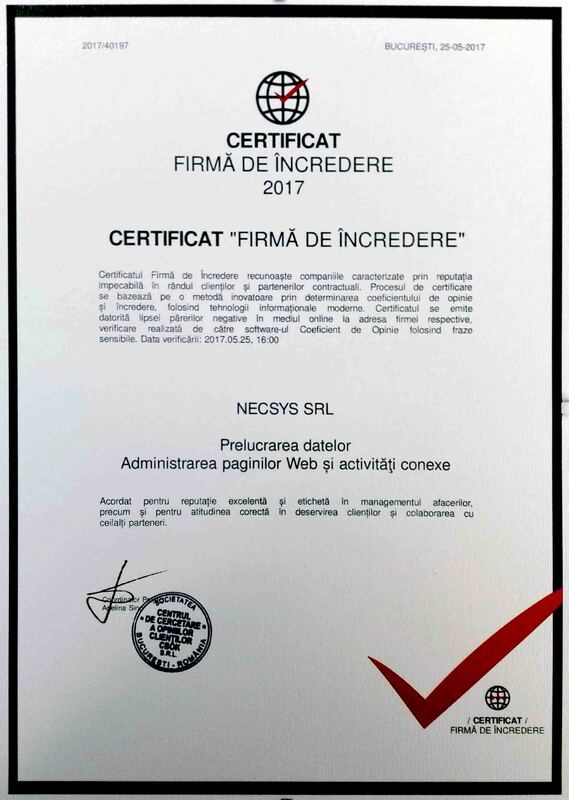 NecSys is a trustworthy company in firmedeincredere.ro's list. Is it better to have a country specific or an international domain name? That depends entirely on the segment of users that you wish to address. If your website/platform is mostly used by visitors from a specific country it is better to use the country's domain name. Because Google shows the results related to the country's domain first, considered to be more relevant than the generic ones. For example, when you search for something on www.google.ro, .ro domains results will be in majority, despite the fact that you used an english keyword. If your website has an international audience, it is highly recommended to choose one of the international domain extensions, such as .com, .org, .net or .info. We provide a safe and reliable package of web and network related services, such as graphic design, web design and network solutions. We provide networking solutions from configuring a small home netwok to setting up a company network, with file servers, acces points, routers, traffic management & security, VPN & VNC and more. Our main purpose at NecSys is creating a safe and reliable network in every location, which can maintain the work flow and productivity. *For multilingual websites, an extra charge is going to be applied, regardless of the choosen web package. We can create any image, poster, bussines card or any other graphic material according to your idea. Along with the evolution of technology, the Internet, the Online Environment and last but not least the End-User Consumer, the strategies that can be adopted in the online environment have also evolved in order to adapt to the current meta. Unfortunately, most of the time both advertising companies and firms lacked the esential vision of a rapid adaptation to the reality of the new enviroment, being permanently trapped in an antagonist view, being away from the trends of the moment. In terms of the services offered by NecSys, we can say that we cover the vast range of online marketing services, being experienced in configuring, monitoring performance and optimization of the marketing actions which you will find below. social media marketing solutions - Facebook Ads, Twitter etc. Do you have a new website? Words campaigns will bring you in the top positions in Google, since the first day of the campaign. Do you want to earn more with your current website? AdWords campaigns will provide the necessary data to know better your clients, to descover new business opportunities,to develop and to increase the profits of the whole site. Google AdWords is a Google product that allows displaying advertisements paid directly to interested persons of your services or products. Advertisements displayed by Google AdWords text ads are appearing in Google results either banner ads that appear on Google partner sites. Sales: Your ads will be displayed when a person searches for the product or the service offered by you. Google AdWords will boost your sales that comes to help your potential clients and for those who need the product or the service promoted. Contacts: Your ads will be displayed only to those directly interested in you. Each AdWords campaign means objectivity, so your invested budget is on point for every reached plan. Notority: Since the first day of the campaign, Google AdWords brings you in the top positions in Google. 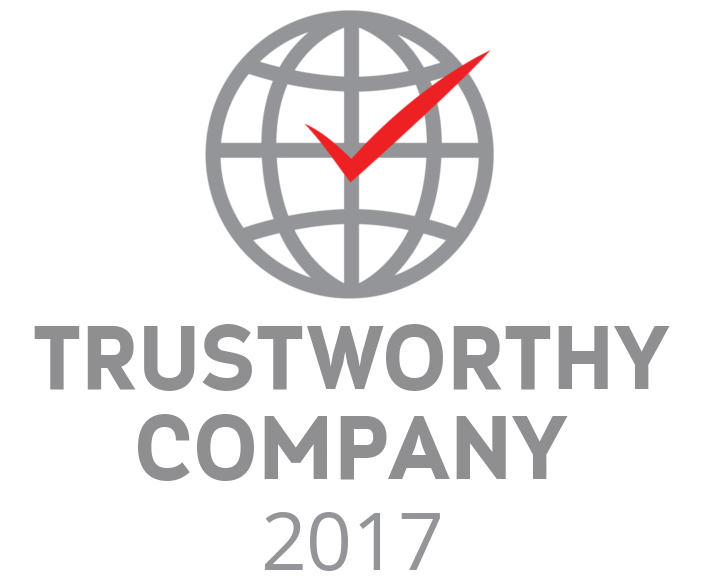 Your company's image will grow in reputation, and your brand will be visible where it counts. Development: Google AdWords is very generous in data and statistics related to your campaign performance,in people who are interested in your products and services and their behavior on your website. With a team of specialists near you, you will discover new opportunities for continuous development of the campaign, as well as your business. Quickness: Google AdWords is an online advertising method with an immediate impact, which can be used in your online marketing strategy, alongside other sustainable measures in time, but with a low initial impact. Budget control: In any moment you will be able to determine which is the budget that is worth to invest in. It can be changed depending on the degree of cost-effectiveness and profitability of the campaign. Remarketing: Google AdWords allows you to keep in touch with the people who have been on your site and are more prone to buy or fill out our contact form. Dedicated team. We are a team of specialists that we handle your campaigns.We create your AdWords strategies suited to your domain and your site. We analyze data and bring permanent improvements. Google certification. We are abreast of the innovations brought about by Google and we always use new strategies based upon them. Oriented for succes & results. Together with you we determine what are the objectives of the campaign and we are committed to fulfilling them. We provide solutions for improving your campaign, as well as for the improvement of the entire site. Transparency. We make monthly reports on the results obtained, and anytime we answer your questions related to your AdWords campaigns. We will meet with you and we will determine together which are the next steps. NecSys also provides SEO services relying on specialized personnel in the field and who can influence the search engines through optimization and promotion services in order to increase organic traffic. Good results in search engines are due to SEO services, applied naturally. 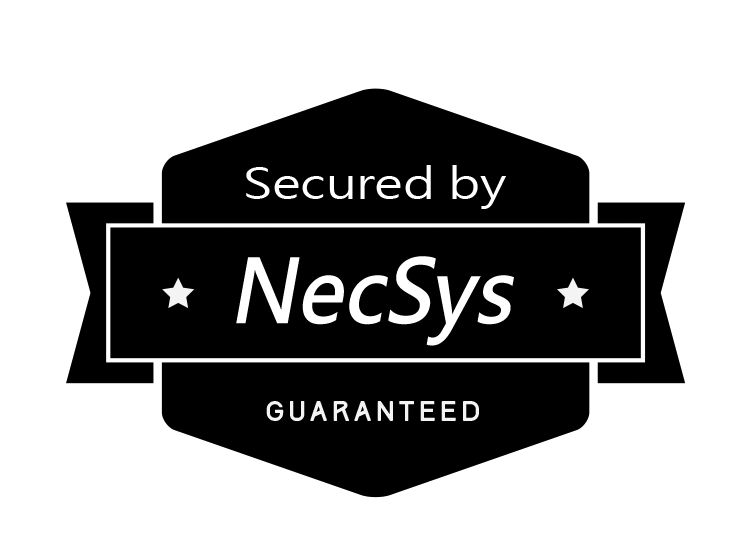 NecSys SRL prohibits the use of the service in any way that would result with the consequence in the transmission, distribution and delivery of unsolicited electronic mail in large volume or unsolicited commercial messages ("Spam"). By spam sending we refer to the delivery of unsolicited messages behind which we can receive complaints from those who receive them, use or distribution lists of emails that belong to the persons who have not given their consent, posting commercial articles on the USENET newsgroup,that does not allow this, posting articles containing binary encoded data in, posting massive comments on groups, forums that have no connection with the subject that is being discussed, the continuously sending of abusive material that may be considered offensive In order to ensure the best conditions for all customers, NecSys adoptsan tolerance-free politics for the subscriptions that send SPAM. This policy may involve the suspension of any subscription that turns out to be the source of SPAM. In order to eliminate various problems hosting subscriptions can send a maximum of 6 emails messages per minute. There is no exception to this rule. Any customer who wishes to send more emails per hour, will have to ask the express permission to NecSys. At all the email lists,that the owner of the email address needs to express their explicit desire to receive emails from you and to confirm that the email address belongs to him. It is not allowed the email sending to other email lists purchased or received. Sending emails to these lists will be considered as SPAM and will result in suspension of your hosting account unconditional. If NecSys considers that an inproper and unauthorized use of any service takes place, it may take, withought prior notice, the measures that we considercorrect,according to our own considerations, in which blocking the messages fron a particular internet domain,the mail server or IP address. NecSys can immediately suppress any account of any service where we find, according to our own considerations, that is transmitted or there is any kind of conection with an e-mail that violates this policy. IF YOU WANT TO KNOW MORE ABOUT US OR YOU HAVE SPECIFIC QUESTIONS, PLEASE USE OUR CONTACT FORM TO WRITE US AN EMAIL OR CALL US AT (+40) 0742639109. Our company offers you complete services of testing and evaluating the security of the infrastructure of your web services. Our team of specialists in web security offers specialised assistance to protect your critical network enviroment and personal data, to strengthen your web applications and to improve your security on the entire company. Stress test to see the stability of the informatics system. Robots attacks using commercial apps and our own apps. Manual attacks using diferent vectors. Exploitation of vulnerabilities in case they are discovered. An attempt to retrieve access on the entire computer system and accessing confidential information. Vulnerabilities and problems discovered will be documented and included in the report, together with recommendations for improving your system. In an audit of web security, real vulnerabilities will be used in trying to access your system, which will cause a temporary interruption of the IT infrastructure (Denial Of Service). It is highly recommended to do a backup of all the data before running a security penetration/ stress test. Have you been hacked? Let us know!